Rosella Picado holds the Ph .D. degree in Civil and Environmental Engineering from the University of California, Berkeley (picado@pbworld.com). To help workers avoid the peak-hour commute, employers have been adopting flextime work schedules. 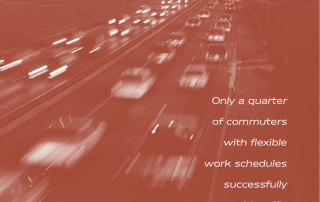 Some workers’ jobs already permit flexible work hours, so a lot of employees should be commuting during off-peak hours. But, alas, the survey I’ve just completed finds it ain’t necessarily so. Given the opportunity to avoid heavy traffic, I had to ask: why does anyone still commute during the peak hours?